Mr. and Mrs. D. W. Bagwill who reside at 1107 North Sherman Street, in this city, will quietly observe their Golden Wedding Anniversary at their home Thursday of this week, July 28. Mr. and Mrs. Bagwill were married July 28, 1888, at Murphysboro, Jackson County, Illinois, and came to Texas and to Collin County in 1891, three years later. They have lived in McKinney and near this city since. This well-known and respected couple are receiving the congratulations of a host of friends on the observance of their fiftieth wedding anniversary, who wish them many more years of happy wedded life. Mr. and Mrs. Bagwill are the parents of four children: Editor A. 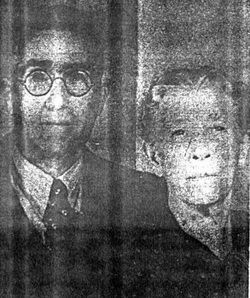 A. Bagwill of Plano, Editor and owner of the Plano Star-Courier and the Frisco Journal; Mrs. Harold Reinhardt of Mineral Wells; Mrs. R. O. Melton of the Cottage Hill community and Don W. Bagwill, City Editor of these papers. Mrs. Bagwill is a sister of Postmaster Walter B. Wilson and of J. B. Wilson, rental agent, of this city.